Cooking is a profession in Isleward to produce Consumables such as Carp on a Stick. 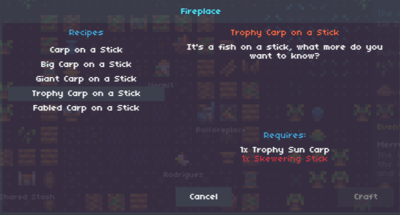 You can cook food by fishing for Sun Carp and purchasing a Skewering Stick from Hermit, access the Fireplace at Hermit's Shack by pressing U, select the recipe to cook and press Craft. Cooking was added in v0.2.1. This page was last modified on 16 January 2019, at 22:31.